Since Wednesday’s comic involves sales (or lack thereof), and I just opened up a Project Wonderful ad slot, I’m in a money mood, so allow me to introduce one of the most ubiquitous of Japanese expressions: Irasshaimase!!! (I’m assuming exclamation marks are a legal requirement when writing irasshaimase!, but the multiples are a bonus.) Enter any store, restaurant, or shopping center, and you’ll hear this hail of “Welcome!” ring out like a capitalistic battle cry, or, maybe more appropriately, like the mating call of the domestic sales clerk desperate to attract a willing wad of cash (brought to you by Mutual of Omaha’s Wild Kingdom). Irasshaimase can come in variations, depending on the region and the speaker. My favorite, The machine-gun welcome: ‘rasshai-’rasshai-’rasshai!! Often heard in more down to earth establishments, like busy fish markets, I think. There’s something very… car salesman-ish about this approach. In contrast, consider a common American store greeting: “Whaddaya want? (sneer optional). I’ve found a sample at David in Japan, but nothing yet of my favorite version. Holler if you find a link! Zen zen David Duchovny no munya munya wo wakaranai. Munya munya is part of a whole class (no, not that kind of class) of Japanese onomatopoeia words (hardest task today: figuring out how to spell onomatopoeia), including both words that represent the sound of something, like munya munya, and words that represent the feeling of something, like peko peko (the feeling of being really hungry). In Wednesday’s comic, Lyle espoused the belief that a person or situation only has control over someone who allows that control. It was part of the set-up for a gag, but this was also a case of me speaking through one of my characters. I do think it can be hard to figure out how to pull yourself away from another’s control, especially if the consequences make hits on other things you want–like a steady paycheck and benefits, in Colin’s case–but that there always tends to be some way around, if you can find it, or if you’re willing to sacrifice. I’ve heard that this was a phrase often used in the days after World War II, when Japan, and many of its people’s lives, were in shambles. Rather than wallow in self-pity, folks would shrug and say, “shou ga nai,” and continue on pushing through as best they could. So that’s the positive way to look at the expression, and to use the sentiment. It’s awfully easy, though, for me–and I imagine lots of other folks–to slide into the negative side of that platitude: “You can’t do anything about it, so don’t even try. Resign yourself to the way things are.” I don’t necessarily think that’s the way the expression was really meant. So maybe this post is just me reminding myself: There almost always is another way, if you can just find it. Shou ga aru. In honor of the horrid season of Halloween, I thought I’d give you a peek into the world of Japanese monsters. Or, rather, I’ll give you a link to one of my favorite sites, the Obakemono Project, where you can study up on these occult secrets. Barring ill fate, I’ll aim to post one of these monster links every week this month. Now, go study up, and watch your step at the river bank. Continuing the October obake-a-week theme, I present the fearsome umi-bouzu. 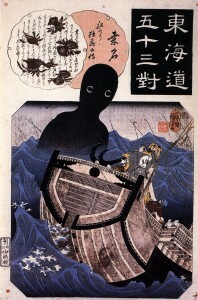 Before reading about the umi-bouzu at the Obakemono Project, I confess I’d never heard of it, but given the significance of the sea in Japanese culture, a hulking faceless ocean beast seems inevitable. According to said site, the umi-bouzu “is most commonly conceived as something huge and pitch black with ambiguously human features and a common lack of eyes or hair.” So, sort of a deep sea blob with a wicked attitude (maybe a relative of the great C’thulu?). Study up at the Obakemono Project, and beware the dark shapes of the briny deep. I’d be remiss this week, in light of my Halloween Ring parody, if I didn’t give you a peek at the onryou, usually depicted in stories as the vengeful spirit of a wronged woman. 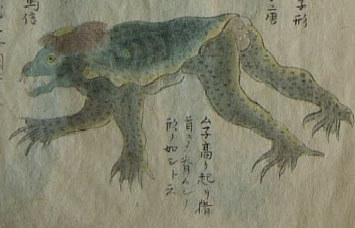 The onryou is one of several classes of ghost (not entirely unlike a class 5 full roaming vapor) found in Japanese folklore. 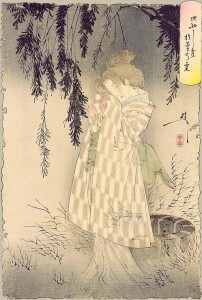 One of the most famous onryou, and the partial basis for Ring, is the spirit of Okiku, a young servant girl murdered in a romantic embroilment and thrown down a well. You can get the nutshells of three variations of Okiku’s story at Wikipedia, among other places. And do be careful around any open wells or unmarked video tapes. In the vein of strange and fearsome female spectres, allow me to introduce you to the rokurokubi. 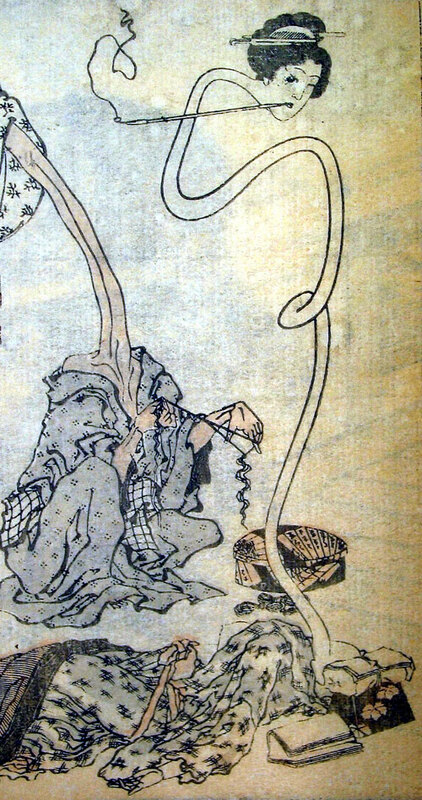 Typically depicted as a normal, if mysterious, young woman during the day, the rokurokubi is actually a youkai with the ability to stretch its neck to supernatural lengths after nightfall. 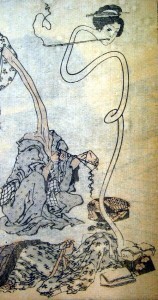 Depending on the story, the rokurokubi may be a largely harmless or even unknowingly cursed maiden, or a sinister blood-sucking fiend. Most are tricksters, and delight in scaring the pants off mortals. I first learned about kuchisake-onna from a friend, when I lived in Japan, who told me the mysterious tale of a seemingly beautiful woman you might meet while alone, at night, on a dark city street. The woman–apparently suffering a cold, given the surgical mask she’s wearing–will ask you: “Do you think I’m pretty?” Upon hearing your reply, she’ll rip off her mask to reveal a hideously extended mouth that would put a Glasgow smile to shame, after which she’ll chase you down with something sharp. In short, she’s the Japanese Hook Man. I was inspired to post about this ghoul by seeing a link (at Pink Tentacle) earlier this week to Matthew Meyer’s “A Yokai-a-Day” series of art blog posts, in which was included a wonderfully creepy painting of the aforementioned specter, and loads of other yokai. I had no idea the kuchisake-onna had a history before her resurgence as an urban legend, but Mr. Meyer’s write-up revealed both the split-mouth woman’s past and the gorier details of how an encounter with her can play out. So, check out the Yokai-a-Day post, and be careful who you run into this Halloween night!